Monson’s Snow Roller Day is usually held on the third Saturday in February. The first snow roller for this area was built in 1914 by Walter Sears of Willimantic. Walter had a workshop at his home and made sleds, sharpened axes and other odd jobs. The snow roller was made primarily of spruce and oak and was equipped with round rollers each measuring about six feet wide and five feet in diameter. The rig had shallow troughs in front and back. One carried feed for the horses and the other was used for shovels and other equipment. Prior to this horse-drawn machine, people had a difficult time getting around in the winter months and travel was limited. With the roller in operation, the roads were smooth and made sleighing and walking easier. Most towns in New England had rollers, using oxen rather then horsepower but very few rollers are intact for the public to see today. It was said they performed well in light fluffy snow, but heavy wet snow would stick to the rollers, which would need to be cleaned off before continuing the road. Also, as spring approached, the 8 to 10 feet of packed snow would turn to ice, and of course when that melted, there was plenty of mud! The roller was last operated during the winter of 1932–33. The last two drivers were Delmont Weston and Crosby Robbins who spelled one another using teams owned by Linwood Patterson and Albert Anderson. Several farmers with teams took turns rolling the roads, operating the roller with two teams of horses—three teams if the snow was particularly heavy. Bill Dauphinee remembers that it took all day to roll the Seven Mile Square Road. If it was particularly cold, a driver and team would go until their hands got very cold and then another farmer with his team would take over. He also noted that the farmer with the roller had the best driveways! Rex Turner of Willimantic remembers drivers in that town were Linwood Patterson, Cliff Leighton and Albert Anderson. In Monson, it was Philip Knight. Jette Hennigan remembered the roller coming out from behind Knights’ store where it was kept in the stable of John Flint. Philip believes Julius Carlberg of Monson was one of the operators. Bill Robinson thought some of the Southeast Monson drivers were Lawson Daulphinee, Frank Steward, Leslie Robinson and William Champion. Jim Brown recalled that as a boy he remembers the roller going past his Abbot home and that it was the Monson roller. Apparently, Abbot didn’t have one at that time and must have contracted the one from Monson. 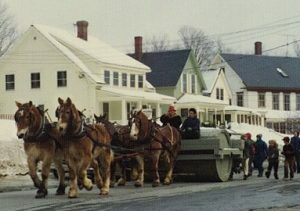 In 1973, Paul Patterson of Bangor, formerly of Willimantic, donated the roller to the Monson Historical society where it has been kept in storage at the Museum. The roller was moved October 3rd of that year by Fred Turner, Gordon Hall, Paul Allen, Rodney Allen, Robert Lander and Philip Knight. The first Snow Roller Day was held February 8, 1975.